I definitely could use one of these! 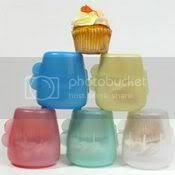 I saw these on the Cupcake Queen’s blog and I think they are terrific! Haven’t you been frustrated when that beautiful cupcake you brought for your lunch is just one big messy blob by the time lunch time comes around? I know my girls wish they could show off their cupcake creations rather than making the cursory, “trust me, it tastes better than it looks” comment to their lunch mates. 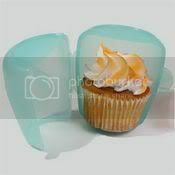 As you can see from the photo “borrowed” from the sellers website, even upside down, the cupcakes retain their shapely frosting. I haven’t seen these at the store yet, so if you are interested in getting some, I suggest you visit the cup-a-cake website too. Woohooo!!! thanks, sis 😀 Not like I was fishing for a present, but THANK YOUUUUUUUUU!!!!! hehe! You got my day started off on the right foot.